As in most things, knowledge is key and laying floor tile is no exception. Today we'll look at some potential problems that can occur from incorrect floor tile installations and what you can do to avoid them. Many tile installations are laid directly onto concrete slabs by adding a layer of thinset and applying the tile directly. However the potential problem here lies in the two items, the concrete slab and the tile. Concrete, like everything, expands and contracts and it does so at a different rate than the tile that is adhered to it. Naturally when two attached items move at different rates, something has to give and in this case it's usually the tile. Wooden sub floors will also move at different rates. The resulting movement to the tile is called "tenting" and much as the name implies the tile looks like a little tent when forced together. "Tenting in a tile floor"
The solution is to add a layer between the subfloor and the tile that uncouples the floor whether that floor is concrete or wood. Using a cement board from various manufacturers or a product from Schluter called "Ditra." Both products will effectively keep the subfloor and tile moving around at their own rates, leaving all parties content and in place. Below is a great video showing the installation of floor tile and Ditra done properly. This is for a wood substrate but Ditra is also a great product to use on concrete slabs too. Tenting can also happen because the tile was grouted right to the baseboard versus leaving that last wall to joint empty (no grout there) and applying the baseboard above the tile. This leaves a place for expansion. Another area of potential concern are kitchen and bath cabinets so make sure that you allow for expansion areas along those edges too. Oddly you may not even consider this one but plants that are large and in heavy pots can cause tenting. 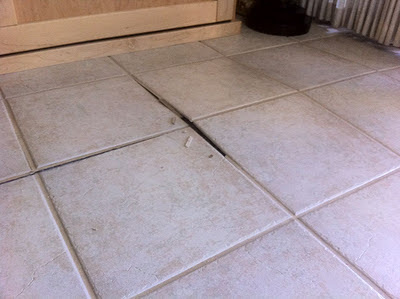 Due to the large size of the plant, pot and soil and if they are occupying a few tiles on the floor, those tiles are not being allowed to move at the same rate as their neighboring tiles and the result may be a large cracking noise some evening as the tile moves or rather the other tiles move. You may also want to consider or confer with your installer about installing an expansion joint and again this one is made by Schluter. Generally a distance of 25'-30' is the most that an area should be tiled without adding an expansion joint such as shown below. Another area that re-modelers often face is when two different substrates are to receive a new tile floor. For example part of the area to be tiled is concrete and part is wood. Here we have two different movements to contend with as they both contract and expand at totally different rates. Adding a layer of cement board or Ditra will uncouple the two from the tile and allow them to move at their own rates without effecting the tile above. This one is easy. Just remember that all thinset and grout are made with Portland cement and are dry bagged products. If you are doing the installation yourself and see a premixed thinset or grout on your store shelf and think you'll be saving time and effort, you probably won't be. The product you are viewing is not what you generally will be needing. My advice if you are trying to do a tile installation for the first time, make sure you read and learn all that you can to avoid problems down the road. If you are not 100% sure? My advice would be to hire a professional installer as it will be money well spent over the lifetime of your tiled floor and avoidance of future problems. New York resident, Constance Zaytoun and Marc Weitz, share some "before and after photos" of their recently completed Chelsea kitchen remodel. The transformation is nothing short of amazing. What makes it even more unbelievable is that Constance didn't hire a designer. She managed all of the construction work herself. All while working and attending school, as I found out later. A Cement Tile Backsplash adds WOW to this Kitchen Remodel! Who wouldn't want to savor a cocktail here? Or, make Ratatouille with summer-fresh vegetables. Now look at the "before photo." Yikes! You really need some vision to turn this kitchen around! When you see the transformation you begin to understand that with the right design, anything is possible. Don't be fooled though, these changes take hard work and effort; but, they really are worth it. And what a difference they make! For the record, I refer to Constance in the rest of today's post since I worked with her entirely. But, I know Marc was a major force in the success of this project, too! When Constance called Avente and spoke to me, I knew she had been talking with other cement tile vendors. She asked detailed questions and was frustrated because of the minimum order quantities that many vendors impose on tile that is "made to order." Avente Tile offers many patterns that don't require a minimum quantity or incur small order surcharges. 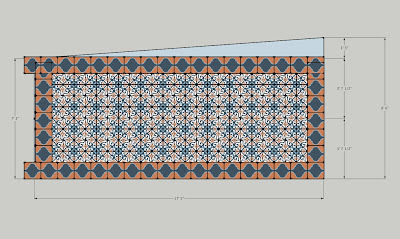 Constance looked at our cement tile catalog and found a few patterns that she liked. She followed my advice and ordered the Eight Piece Heritage Color Chip Set. I explained that this step will help finalize a design, Once you approve the choice of Heritage colors for the Ocoa and Romana patterns, You can then finalize a pattern. Because we don't stock custom, "tile design lines" like our Traditional Cement Tile, you should plan on purchasing a strike-off sample to confirm the color, pattern and design. Constance also purchased a sample of the Mission Trebol A because she liked the pattern and sample stock was available. Once you find a pattern you like, you need to decide on colors. Color chips are necessary. You need to see the texture and how the colors "partner" with other finished surfaces and area light in your home. Constance liked the Heritage colors but wasn't certain whether to go with the the Ocoa Cement Tile or Romana Cement Tile for the kitchen backsplash. I recommend getting strike-off samples for any tiles that are custom or when sample stock is not available in standard colorways. You really need to see the tile you are purchasing before a full order arrives at your door step. These are custom, made-to-order tiles just for you. They can't be returned. A few strike-off samples cost about $150 - $400 since they need to be shipped via International Air. It may seem like a lot of money to spend for a small tile job like this; but, it is the cost of a custom design and absolutely necessary. Too many times, I've seen designers and architects disappointed with the colors used on a pattern after seeing a strike-off sample. There might not be enough contract and the pattern "fades" or two much contrast and the pattern creates an unexpected effect. In about two weeks, Constance received her strike-off tile samples and you can see Romana was her choice. In the end, this was the best choice because it maintain the clean lines and style in this contemporary kitchen. The kitchen features some extraordinary materials that all work together to create a warm, inviting kitchen that pops and with energy. The kitchen's cement tile backsplash is definitely the focus. Cement tiles aren't commonly used in kitchen backsplashes or wall installations in the US. However, it is very common in Europe. A non-traditional mix of texture and color in the other finished surfaces is flawlessly combined to create style and atmosphere. The Zinc countertops are a striking touch and have a hand-made edge finish. They are made in California by Copperworks. The wall cabinets are made by Ikea: Rubrick blue accent glass doors with aluminum edge. the color goes great with the cement tile! The base cabinets are maple-faced and sport groovy bakelite knobs and pulls. You'll find Portola Paints Hollywood on the walls and Globe Thistle on the soffit ceiling. The kitchen is well-appointed with top-notch tools. There's going to be some good cooking in this kitchen with a Fagor refrigerator, Viking range, Bosch dishwasher, Kraus faucet, Houzer sink, Elica hood, and GE microwave. The front door is the original metal fire door. It was stripped to bare metal. The open wall shelves are from IKEA and painted with Annie Sloan chalk paints in Paris Grey and Arles. Pendant lights by Original BTC and a Possini ceiling fixture. The flooring is Jelinek Cork Mosaic. And hardwood floors were refinished with Rubio Monocoat fume and silver grey oil plus.Angled power strip and under-cabinet lighting is by Task Lighting. I hope you enjoyed seeing Marc and Constance's remodeled Chelsea kitchen. What a stunning and well-executed design. Kudos for a job well done! 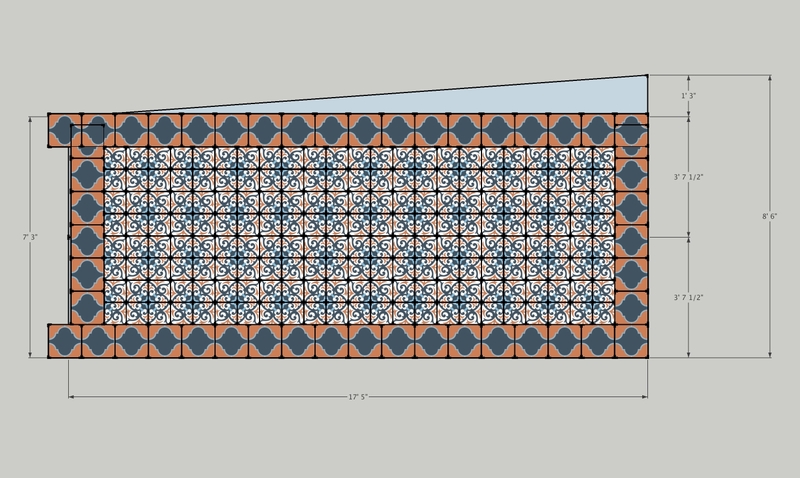 I hope you have a better idea of what to expect when using cement tiles for your project, too. Call us to discuss your project. Take your time and browse our Cement Tile collection and photos of cement tile design ideas. You are sure to find a pattern, color and style of cement tile that speaks to you. Now, create the kitchen of your dreams with handmade cement tile. 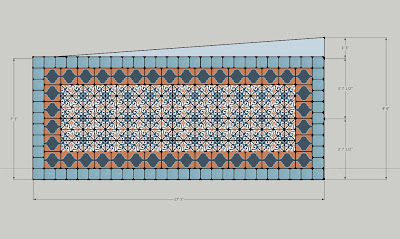 We've shown how to create a cement tile floor plan or layout for large patterns and layouts for double double border patterns. Today I'll share a recent project where Avente Tile provided layout design options for a customer that wanted to use concrete tiles for her patio. The customer wanted a tile rug that would take up the entire rectangular area of the patio floor space. She wanted the patterned field to be framed with a single row of border tiles that would run next to the edge of the patio. She needed a floor tile plan or layout drawing to help visualize the tile layout and determine the quantity of tiles needed. She wanted to use 12"x12" Colonial border tile with an 8"x8" Mission Espanola field tile. The colors for the pattern tiles were all specified using the Mission Color Palette. To complicate matters the patio was irregularly shaped. 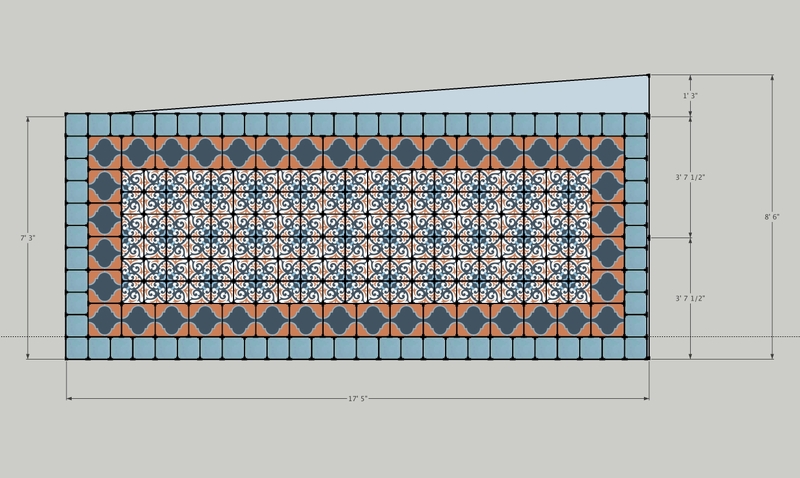 To determine the tiles you need, start with a scaled drawing of the patio. Make a rectangle in the main area and find the center. This is where the tile rug will be. Start laying tile from the center out using paper and pencil, rather than mortar and grout. Right away you'll encounter any problems with the layout that you will need to take into consideration and resolve. You can see this design isn't going to work. Something has to give. We can't place the border pattern along patio's edge without making unsightly cuts. In the drawing below, we show this by the uncut tiles on the left. I generally don't recommend a border pattern that is a different size from the field because for this very reason. It adds complexity to the layout design. If you choose to use border tiles that are a different size than your field tile, your rug width and length will have to be a multiple of both tile sizes to avoid cutting the border tile and disrupting the pattern. If you are using an 8”x8” field tile for the rug and trimming with a 12”x12” border; the width could be 48” (6 tiles x 8” = 48"; 4 tiles x 12" = 48"). So, we did just that. We found multiples that would work! The rug has to be 48" x 168". That's the only way it can work without cutting tiles. Notice, you still have "one-half a pattern" of field tile on the left edge? Not ideal. 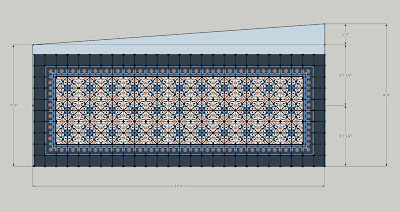 Therefore, we presented another option using an 8" tile for the border that the customer liked. Here's the result: a winning cement tile layout! I'm really pleased with the final design and so is our customer. The tiles have been ordered and arrived. They should be installed soon. I can't wait to see the cement tile patio! What about you? What design to you prefer? Generally, use the same size border tile as field tile. It makes the installation and layout much easier. If you choose to use border tiles that are a different size from your field tile, your rug width and length must be a multiple of both tile sizes to avoid unsightly cuts in the border pattern. If you are using an 8"x8" field tile for the rug and trimming with a 12"x12" border; the width could be 48" because it requires exactly six 8" tiles and exactly four 12" tiles. Don't run the border to the edge of the room. Even if it fits; nothing is ever square and they'll need to be cut. Cuts on pattern tile really accentuate a room being "out of square." Allow for at least one or more rows of solid-color fill tile outside the border. Fill tile are solid color tiles that fill the irregular parts of the room outside the border. Center the rug in the main area of the irregularly shaped room. This will usually be a rectangular shape, so it's easy to find the center. Make sure you use the same number of tiles on each side of the long axis. Create the floor layout plan to scale otherwise the drawing is useless. Any obvious omissions or errors will become obvious with a floor tile plan or layout for your cement tile installation. It's also a great way to communicate with your installer and avoid costly installation errors. This month's project pick comes from Celia Reiss. She is a designer at her firm, Celia Reiss Interiors, in Manhattan, New York. 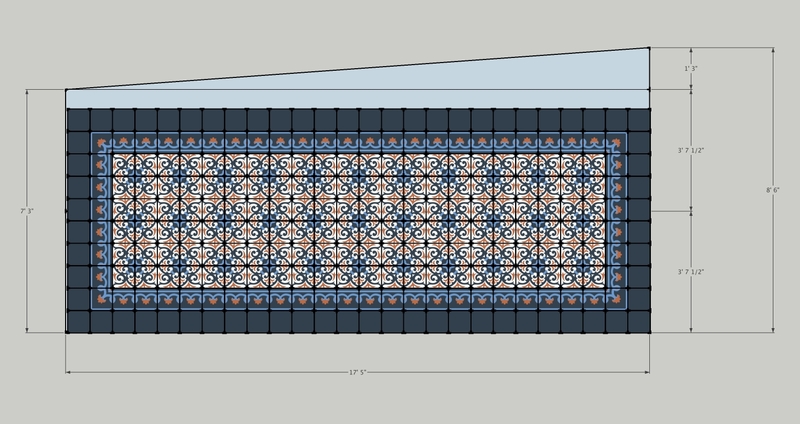 Celia shared an image showing how she used Cuban Heritage cement tiles in a design for her own bathroom. Celia loves cement tiles and it shows in this design! "The tiles were installed in my own home to be able to show my clients how fabulous it would look." I love that the floor tile wraps up to surround the bath. The tiles carry the pattern on both vertical and horizontal surfaces creating a very sophisticated look. The bath tile is in perfect balance with the floor tile. The antiqued wood vanity with marble top creates a rich, but comfortable space. You can see more images of this project on her blog at Bathroom with a French Moroccan twist. There are wonderful images that detail the vanity, pulls and sink - not to mention the tile.